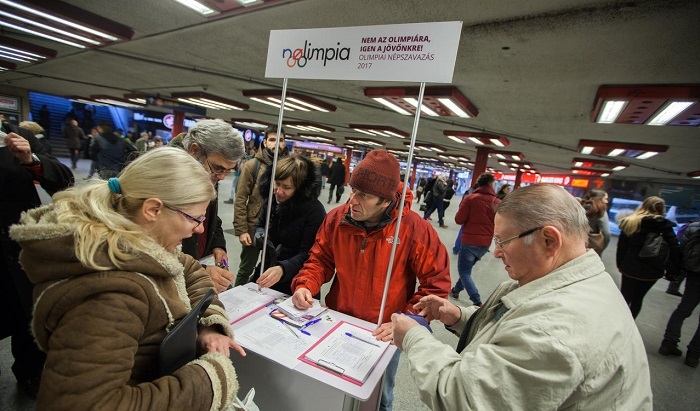 Momentum Movement’s NOlympics campaign had a strong start yesterday as it managed to collect over 10,000 signatures in support of holding a referendum on Budapest hosting the 2024 Summer Olympics. The youth political movement posted activists at 25 signature collection points across the capital, and must collect 138,000 signatures in the next 30 days to force a referendum. In addition to stands in Budapest, the group has reportedly launched signature collection campaigns in Paris, London, Brussels, Berlin, Amsterdam, Rotterdam and Trier. The referendum question was approved by the Budapest Election Office and would be only a citywide vote, so proof of residency in Budapest is required to sign the petition. Several opposition political parties have extended their support to the NOlympics campaign. Hungarian Socialist Party (MSZP) chairman Gyula Molnár said in a press conference Thursday that his party, Hungary’s second-largest, supports the Momentum Movement’s initiative to force a referendum. Even those Budapest residents who support hosting the Olympics should sign the petition, Molnár said, because a referendum would create the opportunity for a public discussion on what the Olympics would mean for the country, and the possibilities and risks. Együtt (Together) party chairman Viktor Szigetvári said at a Thursday press conference that his party also supports the initiative and had begun collecting signatures. Budapest has no need for the Olympics, he said, echoing Momentum Movement’s position that the country should rather spend the money on education and the health system. Politics Can Be Different (LMP) also announced Thursday that the party will collect signatures in 20 locations around the city in coming weeks. LMP city assemblyman Antal Csárdi said a referendum would give Budapest residents a chance to give their opinion on better ways to spend the HUF 3 trillion (USD 10.3 billion) it would cost to host the games. Dialogue for Hungary (PM) has pledged its support of the initiative, and will mobilize “several dozen” activists to collect signatures. Read more on our coverage of Momentum Movement and the NOlympics campaign here.